Basically, the Kingdoms of life (The 5 kingdoms) was divided on the basis of two aspects, two points. The first was kingdom Classification System, while the second was Division Classification system. Monera: The members of this kingdom are prokaryotes. The kingdom Monera contains bacteria and the cyanobacteria. Protista: Members of the kingdom Protista are eukaryotic. They consist of single cells or colonies of cells. This kingdom includes Amoeba, Paramecium, etc. Plantae: Members of the kingdom Plantae are eukaryotic, multicellular, and photosynthetic. Plants have walled cells. They are usually non-motile. Fungi: Members of the kingdom Fungi are also eukaryotic and multicellular. They also have walled cells and are usually non- motile. Mode of nutrition distinguishes fungi from plants. Fungi are decomposers. Fungi digest organic matter outside the body and absorb the broken products. Animalia: Members of the kingdom Animalia are eukaryotic and multicellular. They feed by ingesting other organisms or parts of other organisms. Their cells lack walls and they are usually motile. Archaea: These are prokaryotic microbes. They live in extreme environment such as high temperature rift valleys on ocean floor, or high-salt or acidic environments. All members of the Archaea inhabit anaerobic environments. These environments show the conditions on the earth at the time of origin. The Archaea are the most primitive life form. Ancient Achaeans gave rise to two other domains of organisms. Eubacteria: These include true bacteria. These are included prokaryotic micro-organisms. Eukarya: The Eukarya include all eukaryotic organisms. The Eukarya diverged more recently than the Eubacteria from the Archaea. Thus, the Eukarya are more closely to Archaea than the Eubacteria. 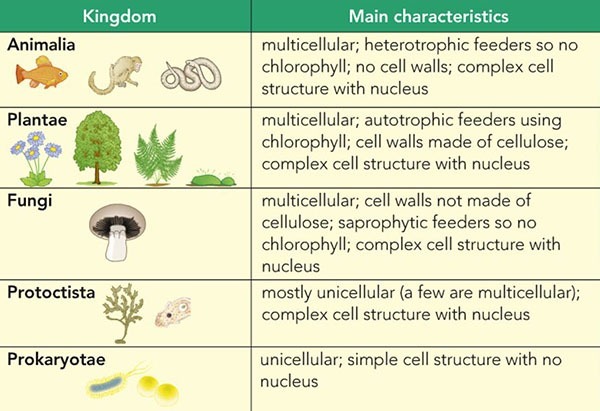 It includes the other four kingdoms of eukaryotes: Protista (Protoctista), fungi, Plantae and Animalia. Plant biologists use the term division for the major plant groups within the plant kingdom. Division is equal to phylum. Divisions are further subdivided into classes, orders, families, and genera.